Today on Friday Inspiration, Romely Levezow of Makana Candles, shares with us her life, her journey to entrepreneurship and how she ended up getting her eco-friendly and artisan soy candles into Whole Foods. She shares with us her inspiration, what she reads, something fun about herself and some advise for those looking to start their own business. How Did It All Begin? How did you end up making candles? I had a cancer scare a few years ago and it prompted me to make changes in my life and take charge of my health – to eat better, live a healthier lifestyle and eat more organic foods. I also started looking at product labels more closely and found that there are carcinogenic and toxic ingredients in many products that we use daily. On a mission to improve my health, I immediately got rid of all household, body care and food products that contained toxic ingredients and replaced them with safe, natural-based alternatives. Since I burned candles often, I also researched candle ingredients and was shocked to find that most candles in the market today – even soy/vegetable wax candles – contain chemicals that are dangerous to our health. So my candle-making journey began. My home kitchen turned into an apothecary and I started experimenting with a multitude of natural waxes, essential oils, and natural wicking. It took over one year of constant experimenting, research, trial-and-error just to get the right combination and apply specific blending and pouring techniques to create non-toxic, clean-burning, 100% soy wax candles that do not contain petroleum by-products, phthalates, dyes, chemical additives, enhancers, preservatives or lead wicking. My husband, Josh, was on board with me and he creates our beautiful graphics and packaging designs. Together, we founded Makana. Makana means “gift” in Hawaiian. Soon after, we had to move out of our kitchen and leased our first candle studio/office in the artist community of Laguna Beach, California. We now recently moved to a new candle studio in nearby Laguna Hills California. How did you get your product into Whole Foods In Such a Short Time? It was probably an unconventional way of doing it, but after much convincing, I dropped off some samples at my local Whole Foods and after one week I called the buyer for the Lifestyles/Whole Body department to follow-up. I figured, the worst they can say is “no” but I at least wanted to try. As it turned out, the buyer loved the candles and I met with her the next week and got a purchase order. After that, other Whole Foods locations learned about our candles and ordered. What is a typical day like at Makana Studio? At our candle studio, every day is different. What’s constant is the passion we have for our products and love for working with our retailers and customers. 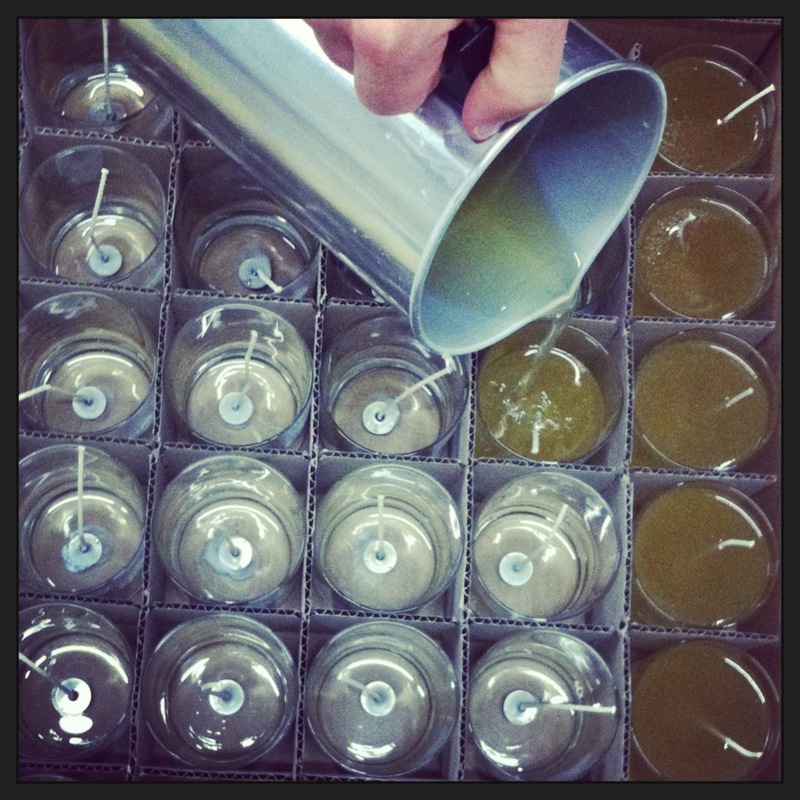 As for candle making, we pour candles by hand in the artisanal method. Each day, our candles are hand-poured in small batches and made fresh so that they aren’t sitting on shelves for months and months before shipping to stores. Also, all of our ingredients, as well as our packaging, are made in the USA. In many cases, we buy from local suppliers and small businesses. in soft paper and pleated at the top so that the folds of the paper mimic a seashell design. Today, we are hand-wrapping our White Pearl Tuberose candles and our Lehua Honey candles that were poured a few days ago. What inspires you when deciding on a scent for a candle line? I’m constantly in product development mode and always brainstorming about new products and scent creations. At the same time, Josh, is also planning our next packaging designs and color combinations. We work together so that the scent and design translate and are cohesive with our branding. As for fragrance inspiration, I am also a traditionally-trained hula dancer and the entire line is inspired by the exotic scents of the islands. Dancing hula and being close to the Hawaiian culture (even though we are in Southern California), we consider flowers, leaves and things from nature very special and meaningful. For me, tropical flowers and foliage are true inspiration when it comes to launching new scents for my line. Why did you choose to make soy candles & eco-friendly candles not just pretty looking or smelling candles? These days it’s hard to find products that are both green and have a nice aesthetic, but we believe that being both green and beautiful can be achieved. 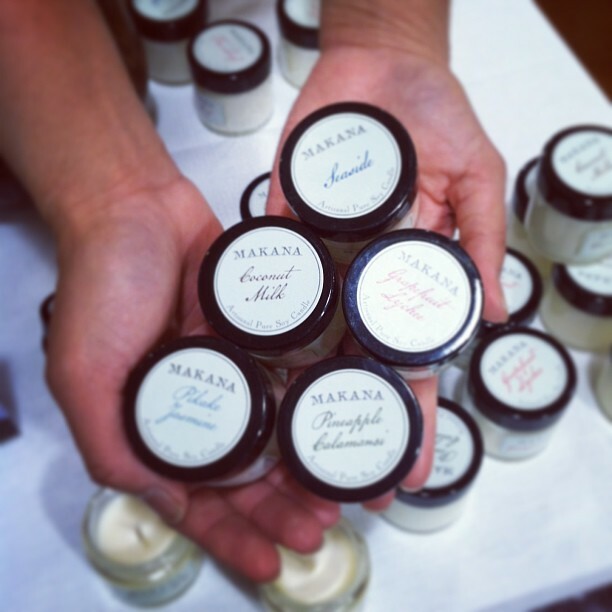 It is wonderful to get calls and emails from customers around the world about their Makana candle experience. We are often told that the packaging is eye-catching and is the reason why they reached for the candles in the first place, but also that the fragrance and performance make our candles a complete package. We get compliments on our candles burning cleanly, without the black soot that form on the glass, and they melt smoothly all the way to the edges with a soft scent that is not overwhelming. We’ve also had calls from customers who have severe asthma and our candles are the only ones they can burn. It makes my day when people find our candles both pretty and kind to the environment and our health. It makes what I do so worth it! What has been your biggest challenge so far and how have you been able to overcome it? At our company, we Live Aloha. This focuses on treating one another with kindness, respect, humility and grace. It’s working in harmony with the environment – the land, ocean and people – and to embrace what life has to offer. We live by this and we have come to the realization that in business, people aren’t necessarily going to treat us the way we treat them; there are people solely focused on making money. Sure, we are in business to make a living as well and have a successful company, but treating people kindly is just as important for us. We have come to realize that not everybody shares that priority. We make sure that people who are part of our company share the same philosophy. We talk a lot about progress & encouraging people to always take the next step in whatever they do on this blog. To discover & pursue their passions. So what has progress been like for you? How have you seen yourself grow personally & how have you seen progress in your business? When I started making candles, I made them for myself, friends and family. I didn’t think in a million years that it would turn into a business venture. Through it all, I have learned so much and I continue to learn every day. Aside from learning so much about business administration/finance/sales, I have learned that you cannot make everybody happy. In the beginning we offered so many scents and had 5 different candle collections, each having up to 12 scents. We tried to cater to ever person and every nose out there that preferred so many different aromas and taste in the colors and graphics of our packaging. In the end, we had to refocus, find our true voice and focus on who we are and our branding. As a result, customers began to understand what we’re all about. Like in life, you cannot please everyone, but only stay true to who you are. In the end, your passion comes through and people will come to appreciate you from within. What’s your favorite scent from your line? It’s hard to pick a favorite scent because all of them are special and take me to a place and time that’s memorable. If I were to choose one, my most favorite fragrance in my line, which happens to be my favorite flower, is Pikake Jasmine. This variety of jasmine is very special and is named by Princess Ka’iulani after the beautiful peacocks that roamed her gardens in Waikiki. I have found many products that are scented with Pikake but most do not smell like the real flowers. I worked hard at this scent so that the aroma of the real flowers are true. Any favorite books you recommend an entrepreneur reads? I know it may sound cliché, but I believe success is at anyone’s finger tips so long as you give it your all. The thing is, as humans, we let our doubts, fears and insecurities get in the way of taking that first step. We start to overthink, create all these assumptions and lose all confidence to begin anything at all. With that, any book by Malcolm Gladwell (Outliers, The Tipping Point, Blink, and David and Goliath ) is inspiration for me because they focus on our thought process, how we look at certain situations, why some people are successful and others not, how things are perceived a certain way when in reality, they aren’t that way at all, how underdogs can win the battle, etc. His books aren’t specifically for entrepreneurs or the business world, but all information can be applied in both life and definitely in your business. I have a passion for animals. Josh and I were regular volunteers at our local animal shelter and ended up adopting 8 rabbits. Rabbits are among the first to be euthanized due to overcrowding at animal shelters. We would foster them until there was room, but we ended up falling in love with them and adopting 8. In our home, our rabbits had their own room, each with little play areas and condos that Josh built. All are gone now and lived to be about 10 years old. We now have Tank, our wonderful mixed breed dog who we adopted after he was hit by a car and was left in the street. He only has three working legs after the accident, but he really doesn’t know it. He’s happy as a clam and is our “Hospitality Chief” at our office. In the past, we also adopted two sweet little rats. We believe that we rescued them from being sent to an animal laboratory to be used for testing. My dream is to travel to Kenya and do volunteer work at an elephant orphanage. But my ultimate dream, if I won a million dollars, is to open a shelter for all animals, similar to Best Friends Animal Society. 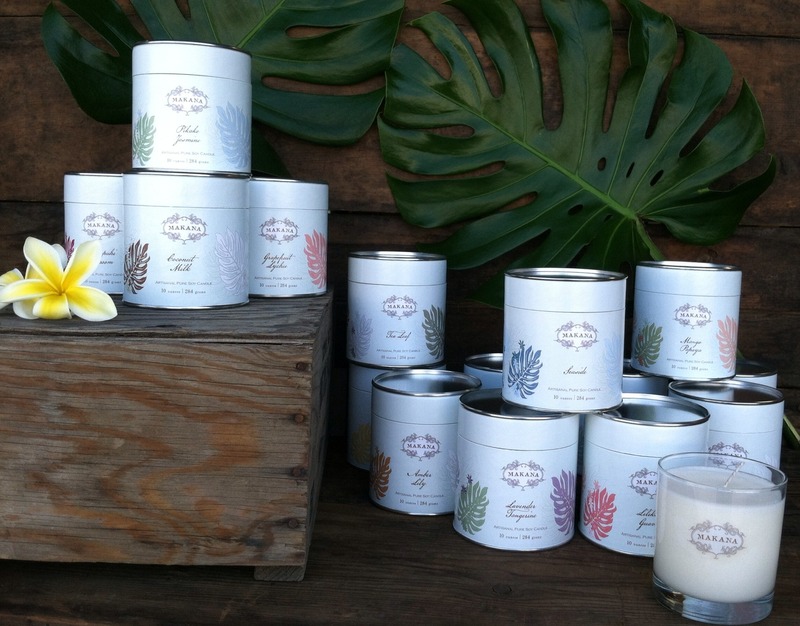 Makana candles can be found in specialty boutiques throughout the U.S., Canada and the Caribbean. In Hawaii, we are carried in luxury resorts, boutiques and spas such as the Four Seasons Resorts, St. Regis Hotels, Fairmont Resorts and the Ritz-Carlton Resorts. We are also carried at the organic market and lifestyle store, Whole Foods in southern California. At this time, we are not hiring, but always accept resumes should any openings come up. Finally, what advise do you have for other people reading this thinking of starting their own venture or have already started? Be fearless. Remember, the worst anyone can say is “no.” The first step is always the hardest and it doesn’t have to be perfect in the beginning. In fact, nothing is ever perfect, and we all make mistakes and learn and grow from them in order to improve. Mistakes are not a sign of weakness, but instead they give us the potential to go forth and do something even greater. Be flexible and open. Don’t feel like you have to have everything mapped out and in place because you will have to adapt and change along the way. Just start the process and take small steps at a time. I think many people overthink things when starting something new. Doubt and fear will eventually set in and will prevent you from starting at all. Just go for it! If you find out that it wasn’t for you, then at least you’ll never wonder or regret. Trust your instincts and be true to yourself. You alone are the author of your own journey and you have to enjoy the ride. You know what feels right for you, so trust your gut. Do not let anyone steer you in the direction they think you should go. Of course, objectively listen to advice and suggestions and take what applies to you and be open to change in order to make your business the best it can be, but do not change who you are and your vision. If we wanted to say hi or ask more questions, Where can we find you online? I welcome any comments, questions or a simple aloha. Next Post Pre Black Friday Special! Romeley the article in OYINDOUBARA iPad Magazine is fabulous! !